Maria’s BEEF TACO MEAT is made with fresh ground beef, TVP, and special seasonings. It is one of the Captain’s fastest growing items. This product is moist but not greasy, and provides superior yields versus other brands. It has a zesty flavor and is easy to use; just heat and serve. Besides traditional tacos, this product is perfect for restaurants making taco pizzas and serving taco salads. Other popular applications include tacos-in-a-bag sold at stadium concessions and convenience stores. No mess, no clean-up. And best of all, great taste! 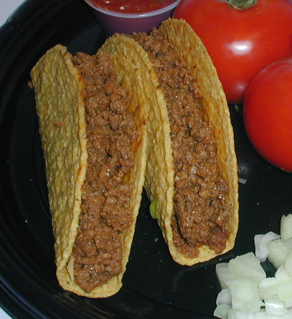 Maria’s BEEF TACO MEAT RS (Reduced Sodium) is made with the same fresh ground beef and seasonings as Maria’s regular taco meat recipe, but 31% less sodium. With a proprietary blend of paprika, chili pepper, garlic, cumin, cayenne pepper, and oregano, taco flavor in this recipe is abundant. Consistent with the Captain’s line of taco meats, this recipe offers multiple menu applications for multiple venues, from restaurants and schools to delis and convenience stores. Let Captain Ken’s make your taco meat. We will save you the mess and clean-up! Captain Ken’s Original MEAT TACO FILLING is a blend of fresh ground beef, ground pork, seasonings, and TVP. This was Captain Ken’s original taco meat recipe. It’s a premium product that offers distinct flavor of ground beef and pork, complemented by Captain’s Ken’s proprietary blend of taco seasoning. Another taco meat alternative for those operators seeking a unique, premium recipe for their menu. Minimum order quanties may be required. Captain Ken’s BEEF TACO MEAT (no filler, no TVP) is a premium recipe made with 100% ground beef, robust tomato sauce, and a proprietary blend of spices offering a spicy and zesty flavor with just the right amount of heat. Like all of Captain Ken’s products, no added prep is needed; just heat and serve. It also offers multiple menu applications. Be creative and build a multi-layer taco salad. See illustration. Note: Lettuce, chips, cheese, and other ingredients shown are not included. Captain Ken’s CHICKEN TACO MEAT includes tender ground chicken, tomato sauce, and a proprietary blend of taco seasoning common to Captain Ken’s line of quality taco meats that continue to build their reputation as operators’ favorites. This recipe is sure to be a hit. Alternate your menu between beef taco meat and chicken taco meat. 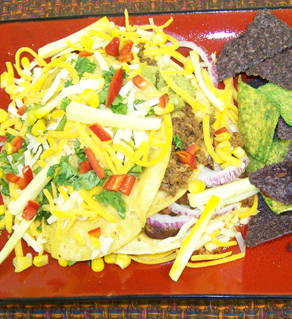 Both are equally versatile ranging from traditional hard-shell tacos and taco salads to taco pizza toppings and more. Also available with shredded chicken (MUPC # 44980).